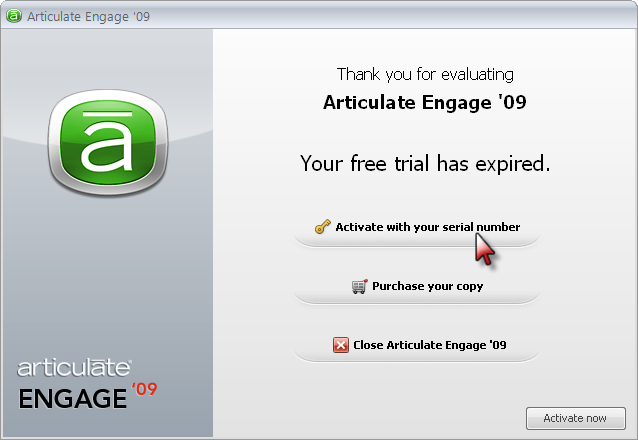 After you have installed Engage ’09, you will have 30 days of trial period, after which you need to activate your software using the serial number you received when you purchased it. Note: Automatic activation will fail if you don't have an Internet connection or your firewall is blocking communication with the Articulate servers. If automatic activation fails, you'll be prompted to proceed with manual activation. See the next section for instructions. Click the button to Activate with your serial number as shown in the image below. Copy and paste your Serial Number into the field provided, and click the Activate button as shown in the image below. Optionally, click Register Now to register your software. You will not be prompted to activate again. Note: If you would prefer to use the Automatic Activation method above, please ensure that you have an Internet connection and that your firewall is configured to allow ap6mn.exe to access the Internet. You will receive the following message: "We are unable to contact our activation server. Please try manual activation." Click the OK button to proceed. When the Manual Activation form appears, click the link that says, "Click here to send us an email requesting your Activation Code" (highlighted in the image below). A new email message should open in your email program. Simply click the Send button, and proceed to the next step. 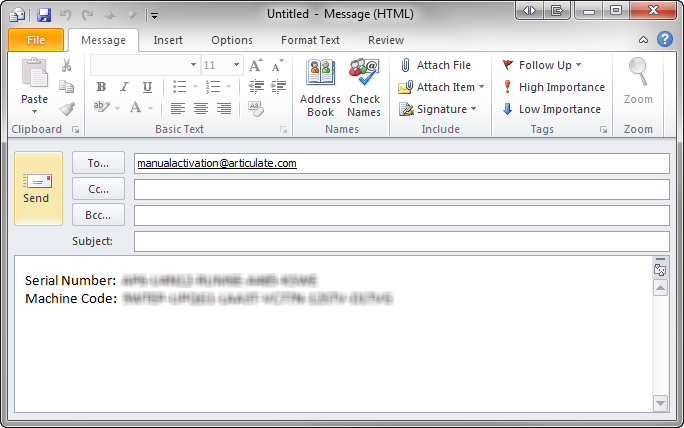 If a new email message does not appear when you click the link noted in the previous step, then please create a new email message addressed to manualactivation@articulate.com, and include the Serial Number and Machine Code displayed on your Manual Activation form. IMPORTANT: The text “Serial Number:” and “Machine Code:”with the colons must be included (as shown in the image below), and you must submit only one Serial Number / Machine Code per email. If you do not receive the automated email response, check your spam or junk folder and ensure that you can receive emails from support@articulate.com. If you still do not receive the automated email response after 10 minutes, submit your request with serial number and machine code details to support@articulate.com. 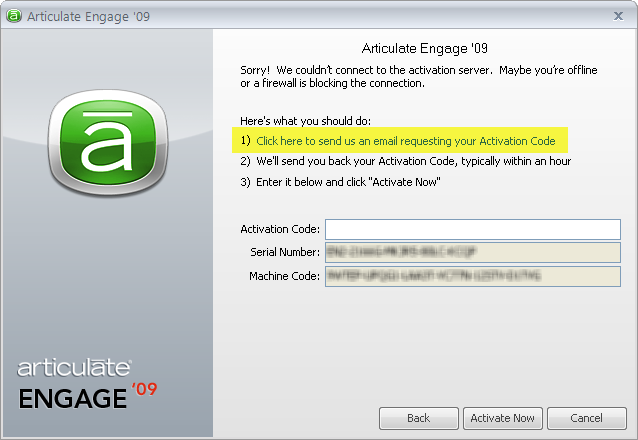 When you receive the email with your Activation Code from Articulate Support, paste it into the Manual Activation form in the specified field, and click the the Activate Now button as shown in the image below. 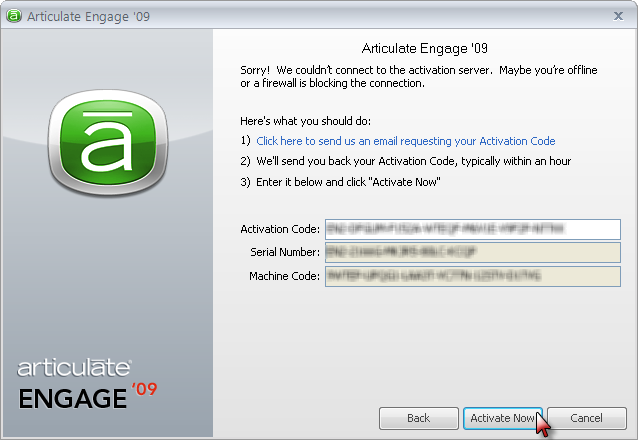 If you are still having difficulty activating after trying both of the activation methods above, please contact Articulate Support.